One of the things I absolutely loved about dining out in Europe was the brilliant use of vegetables in dishes. Cooking with whole foods isn’t a novelty concept or a trend in the UK, it’s just the way food is prepared. I absolutely loved how easy it was to find healthy options. I became addicted to a delicious probiotic rainbow veggie mix while I was living there for the month of September. The vegetables were brined in a delicious, slightly sweet vinaigrette with sea salt, and I ate it by the gallons. Interestingly enough, while we’re usually vaguely aware that we don’t incorporate enough vegetables into our diet, we usually forget that we’re severely deficient on eating enough colors. Studies prove we fail to get enough red, purples, and yellow veggies. Brightly colored veggies contain phytochemicals, which are substances occur naturally only in plants and provide amazing health benefits. According to information from the Produce for Better Health Foundation (PBH), phytochemicals act as antioxidants. They protect and regenerate essential nutrients, and/or work on a cellular level to deactivate cancer-causing substances. 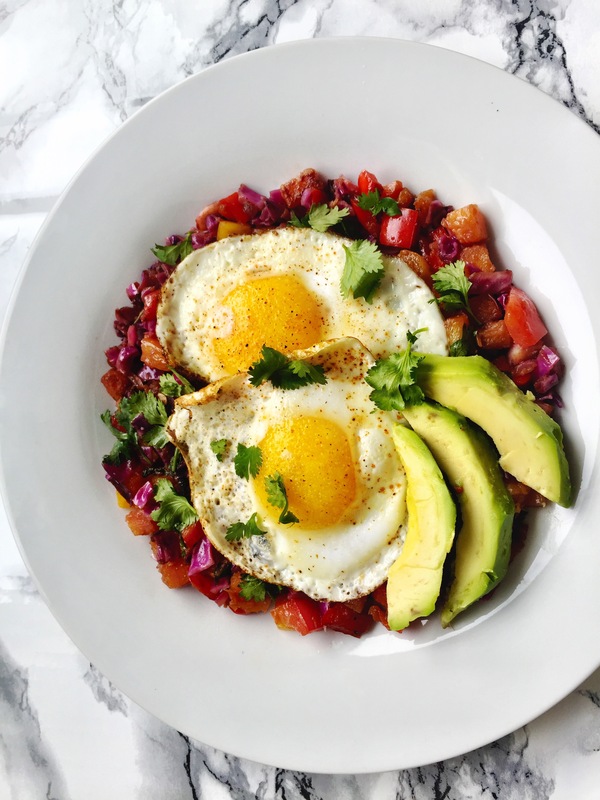 So when you eat this beautiful rainbow dish, you’re not only getting a tasty breakfast, you’re also promoting good health and lower disease risk. Um, holla! I’m a little enthusiastic about obtaining health through our diets, but it’s because we can get healthy via food. You can funnel your money into expensive health treatments, or invest it in good, whole foods. I personally find it incredibly inspiring that we can contribute to our vitality through healthy eating. You can prep your vegetables the up to several days before this recipe, depending on how long you’d like to culture your vegetables for a probiotic effect, or you can prepare them and let them marinate for flavor as you cook. Sterilize mason jar and set aside. Dice veggies into desired size. Mix together in a medium bowl and add pepper flakes and vinegar; sprinkle with salt and mix well. Use a wooden spoon or Cabbage Crusher to lightly press the ingredients to release the juices. Pour all the ingredients into mason jar, pressing slightly to pack and fill the jar to 1 inch below the rim. Pour in water to cover the vegetables completely. If necessary, weigh them down under the brine to keep them submerged. Culture at room temperature (60-70°F is preferred) until desired flavor is achieved. If using a tight lid, burp daily to release excess pressure. Once finished, put a tight lid on the jar and move to cold storage. You can serve these veggies raw and top with eggs, or you can very lightly saute them. Be sure to not overcook them, because we want to preserve as many precious enzymes as we possibly can. Once cooked, toss with fresh cilantro, and serve with the eggs. It’s a delicious way to start the day with a vibrant serving of vegetables. 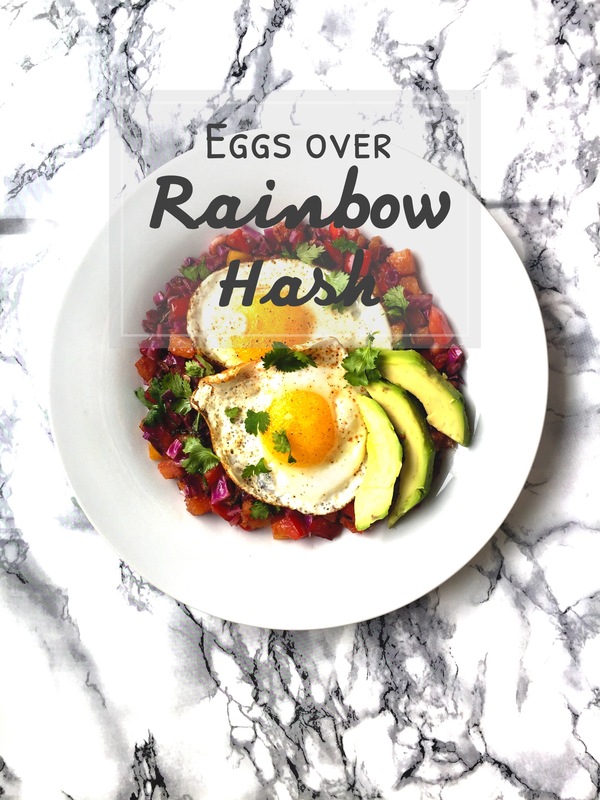 And once the rainbow mix is made, you can use it in salads, on quinoa, with a side of fish…the possibilities are endless! And for my lovely vegans out there, just take that egg right off and top it with tofu or any other ingredient you’d like. I hope you enjoy this incredibly healthy recipe I brought back with me from the UK! It makes me genuinely happy to share little recipes and ways I’m finding to help my own family become more healthy. As always, please feel free to comment and share any health tips and advice or questions you might have! Much love and lots of spice from my kitchen to yours!